MINT CORNER BLOCK OF 4. The bottom right hand stamp has an area of retouch below the fish and behind the fin. St Kitts Nevis 1938-50 5s blusih green and scarlet fresh MNH block of 4 SG77b - ord paper perf 14. MNH - Mint Never Hinged. Used - used and in a good collectable condition. MLH/MM (etc) - a mix of MLH and MM with the majority being MLH. Uk will be 95p for standard envelope size up to 100g, but if the thickness is more, this will be classed as a large letter at 1.30. 1961-65 Set to £1 in Unmounted Mint Blocks of 4. Sg 176-189. UK 2ND CLASS (UPTO £40 TOTAL) FREE. St Helena 1912 KGV ½d black & green PLATE 1 block of four MNH. SG 72. Sc 61. St Helena 1912-16 KGV ½d black & green in an u/m never hinged NW corner Plate 1 block of four. Lightly hinged in margin only. Gibbons # 72. Scott # 61. ST HELENA. 1966 World Cup. SG 205-206. The SG number is given for a guide only. Fine Used Block of Four. MLH - Mint Lightly Hinged – Good clean stamp with little or no hinge remainders. VFU - Very Fine Used. Complete Set of 14 in Plate Corner Blocks of 4. Unmounted Mint. 1961 Definitives. SG 185 (1/6d) in block of 4. The SG catalogue value of this block of 4 is £44. 1961 Definitives. SG 187 (5/-) in block of 4. The SG catalogue value of this block of 4 is £57.20. 1961 Definitives. SG 188 (10/-) in block of 4. The SG catalogue value of this block of 4 is £52. 1953 Definitives. SG 158 (3d value in block of 4) Wire Bird. 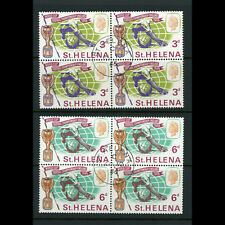 ST HELENA 1938 10/- PURPLE IN BLOCK OF FOUR SG 140 MNH. 1938 10/- PURPLE IN BLOCK OF FOUR. SG 166 to SG 168. Add to Favourites. MINT Lightly Hinged - Full Original Gum. St Kitts Nevis 1938-50 6d green and purple fresh MNH block of 4 SG74c - ord paper perf 14. MNH - Mint Never Hinged. Used - used and in a good collectable condition. MLH/MM (etc) - a mix of MLH and MM with the majority being MLH. Set of 14 in MNH Blocks of 4. ST HELENA 1978 CORONATION 25TH ANNIVESRSARY (QEII, MAYA GOD & LION). SCARCE AS FULL SHEETS USUALLY SOLD AS SINGLE SETS OR PAIRS OF SETS WITH GUTTER. Coronation Blocks Of Four Set. SG 128 to SG 130. Add to Favourites. MINT Never Hinged - Full Original Gum. St Helena Forgery 2d on 6d yellow by Spiro Brothers (West type 1) 'used' block of 4.
:- The item you receive may not be the item scanned, but will be of similar quality. Date of issue: 06 May 1980. You think price is not right?. No Exclusions. Glauben Sie, dass der Preis ist nicht richtig?. Complete Set of 12. Cylinder/Traffic Light Blocks. Tercentenary of the Arrival of Settlers After the Great Fire of London 1967. This is the 1d value (shade) of the set (SG 214a) in a block of 4. Stamp Centenary 1956 (3 values in plate blocks of 4). Mint, never hinged. St Kitts Nevis 1938-50 3d purp and bright scarlet fresh MNH block of 4 SG73d - ord paper perf 14. MNH - Mint Never Hinged. MLH - Mint Light Hinged - lightly hinged no hinge remainders. Used - used and in a good collectable condition. 1953 Coronation Omnibus issue. Block of 4. 1953 Definitives. SG 155 (1½d in block of 4) Heart Shaped Waterfall. The SG catalogue value of this block of 4 is £19.